The main chapter of this book presents the memories of the missionary’s wife Adelheid Meis. She describes her and her husband’s life and work in North Sumatra a hundred years ago. Their work with the Batak was influenced by a very strong sense of mutual love, respect, responsability and the faith in God’s help in difficult and dangerous situations. 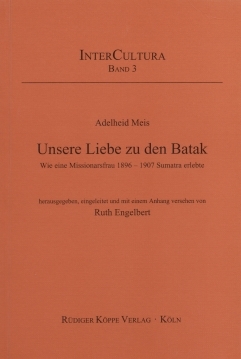 The couple’s granddaughter, Ruth Engelbert (17.10.1930 – 8.6.2009), gives an outline of the beginning of the Batak mission in an introductory chapter, provides the memories with annotations, and relates about the further acting of the Meis couple after their return from the missionary field. Extracts from a travel diary of her brother Hans Dieter Engelbert – result of a jointly undertaken journey in the year 2000, with the aim of following their ancestors’ footsteps – maps, historical and actual pictures, a glossary, a register and a bibliography complete the book. In his Preface (Geleitwort) Prof. Dr. Lothar Schreiner of the Vereinte Evangelische Mission/United in Mission (VEM/UIM) in Wuppertal points out that the present book helps to understand the present situation of Church and Christianity in North Sumatra by examining closely the cultural history of the Batak people in their response to the Christian mission in the 19th century. Thus, it supports the work of partnership groups in Germany and Sumatra. Abridged versions in English and Indonesian language are available at the Archiv- und Museumsstiftung of the Vereinte Evangelische Mission (VEM), Wuppertal/Germany. They include the titles and subtitles as well as short summaries. Furthermore, some episodes are retold which – as far as possible – lay open the spirit of thoughts and actions of the persons involved.